Fat Actress is an American comedy television series starring Kirstie Alley. In the United States, it aired on Showtime from March 7 to April 18, 2005. The series was created and written by Alley and Brenda Hampton. Alley gave a glimpse of the humor and the irony in her battle to lose weight and get back on television in a tough business that prefers the svelte figures seen on the most successful actresses of today. The series was generally unscripted, with each episode emanating from a story outline and the actors largely improvising the dialogue. The storylines were drawn from a heightened perception of Alley's real-life experiences, and some of Alley's friends appeared as themselves in cameos to further blur the lines between truth and fiction. Kirstie Alley (Kirstie Alley) a successful television and movie star whose weight gain has become the subject of every tabloid imaginable as well as the blight of her existence as she tries to find work and true love in an unforgiving Hollywood. Kevyn Shecket (Rachael Harris) Kirstie's live-in hair stylist. Unlike Eddie, she is more of a best friend to Kirstie. Eddie Falcone (Bryan Callen) Kirstie's personal assistant who lives in her garage. He himself is desperate for Hollywood work at any chance he gets he brings up a Hollywood film he did which is "taking film festivals by storm". Sam Rascal (Michael McDonald) Kirstie's manager who disappoints her. Quinn Taylor Scout (Kelly Preston) A young and very famous Hollywood starlet. She is bulimic and helps Kirstie lose much weight as possible, with the craziest and most dangerous diets. Fat Actress was announced in July 2004, with plans to produce six episodes beginning in the fall. Harris and Callen were cast in September 2004. Filming took place in Los Angeles, California. Seven episodes were produced. Kirstie Alley is at the end of her rope. After years of being on top, with a hit show in Cheers & Veronica's Closet, she has hit rock bottom because she is now fat - almost 300 pounds according to tabloids. Kirstie, desperate to rekindle the fame she once had off of Star magazine, She forces her agent to set her up on a big network meeting with Jeff Zucker for a project she has been thinking up. She finds out that he thinks she is too fat for TV. She flirts with an NBC exec and ends up with a Talent Holding Deal, so long as she loses a few pounds. One of the rumors regarding Kirstie's weight gain is that she is having a kid---with Kid Rock! Elsewhere, she is on a mission to land a role in Charlie's Angels III. During the meeting with the director of Charlie's Angels she runs into the love of her life, Kid Rock, but develops a bad case of diarrhea from an overdose of laxatives. During this Eddie rams into Melissa Gilbert's car while ogling Carmen Electra. Kirstie schemes to meet Gwen Stefani but her attempt to meet the No Doubt lead singer lands her in jail, where she reconnects with an ex-boyfriend who has a surprise for her. Kirstie tries a new diet theory and surrounds herself with small things. Kirstie's crackhead brother arrives and suggests that Kirstie start doing crack in order to lose weight and her dysfunctional parents intervene. Merv Griffin sets up Kirstie up with one of his rich friends. At first, Kirstie thinks he is ideal, but he turns out to be an emotional wreck. Kirstie discovers her bank account is running low on funds. She schemes to get another lucrative deal from NBC. She soon sleeps with Jeff Zucker, gets the deal, and a show of her own. 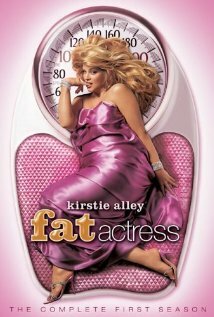 In the United States, Fat Actress premiered on Showtime on March 7, 2005. The series premiere gave the network its highest series ratings, a record that was not beaten until October 2006. Viewership dropped dramatically after the first two episodes aired. The series aired on Movie Central in Western Canada, The Movie Network in Eastern Canada, FX in the UK, Network Ten in Australia and VOX, and Das Vierte in Germany. Fat Actress received mixed reviews. Brian Lowry of Variety wrote a negative review, while Entertainment Weekly gave the series a "C-". A week after its premiere, Showtime announced plans to rush the series' DVD release in order to capitalize on an unusually high awareness of the program. The DVD was scheduled for release on May 24, 2005, rather than the usual six-to-nine-month waiting period for most Showtime shows. The series was added to iTunes in February 2006. ^ "Kirstie Alley to star in 'Fat Actress'". Associated Press. July 28, 2004. Retrieved December 21, 2017. ^ Morfoot, Addie (September 19, 2004). "Rachel Harris and Bryan Callen". Variety. Retrieved December 21, 2017. ^ a b c Lowry, Brian (March 6, 2005). "Fat Actress". Variety. Retrieved December 21, 2017. ^ a b c Hettrick, Scott (March 15, 2005). "Showtime's Alley 'Fat' on DVD fast track: 'Actress' hits shelves in a hurry". Variety. Retrieved December 21, 2017. ^ Flynn, Gillian (February 25, 2005). "Kirstie Alley on her new Showtime series, "Fat Actress"". Entertainment Weekly. Retrieved December 21, 2017. ^ Martin, Denise (October 3, 2006). "Killer 'Dexter' bow". Variety. Retrieved December 21, 2017. ^ Slezak, Michael (September 21, 2005). "TV News: 'Alias'' Vaughn, 'Fat Actress' not dead -- yet!". Entertainment Weekly. Retrieved December 21, 2017. ^ Levine, Stuart (June 14, 2005). "Alley again seeks big one". Variety. Retrieved December 21, 2017. ^ Schwarzbaum, Lisa (March 7, 2005). "Fat Actress". Entertainment Weekly. Retrieved December 21, 2017. ^ Martin, Denise (February 7, 2006). "Showtime expands its Apple fare". Variety. Retrieved December 21, 2017.